Intrepid Travel runs adventure group tours and offers once in a lifetime opportunities to have authentic experiences in international destinations. Intrepid Travel is a small group adventure travel company that offers approximately 800 scheduled itineraries in Asia, Latin America, North America, Europe, The Middle East, Africa, Australia, and Antartica. Intrepid trips are of the grassroots type, and include travel via public transport, local food, and locally owned accommodation. The company is a division of PEAK Adventure Travel Group. Intrepid’s current clientele is “gap” year or younger travelers in their mid twenties. However, through market research, Intrepid identified that there is a huge market for an older demographic. They will be creating a new offering of “comfort” trips designed to appeal to this demographic and seek to upgrade their digital experience for this new product offering. Intrepid has been getting feedback from travel agents and potential customers that it is difficult to search for trips on their site. One of the biggest problems is that customers want to be able to choose destinations based on their vacation time availability. For this project, I had the pleasure of working with Caitlyn Adler, John Pak, and Vicki Kim. This was our group's first project as a team. Responsive website that works well with iPad and/or iPhone application. I volunteered to lead and own the user flow, design, and the prototyping portions. I would ensure that the finished product was consistent with our research and overall design. We started the project creating a survey as the initial point to compile data on travel habits (how travelers planned, their travel preferences, how they book their tickets, etc). We planned to focus on the 50+ demographic as the brief mentioned "older demographics" - we figured they would have the time and spending power for comfort trips. We pulled existing data from various sources (Immersion Active, AARP Travel Research) that have already done studies on our audience. As a final step, we reached out to some of our survey respondents that fit the demographic to understand some additional in-depth details before establishing the persona. Below was the result. Understanding our persona and their needs, we shifted gears to site research, comparing Intrepid’s process with other competitors including G Adventures, National Geographic Expeditions, and Mountain Travel Sobek in order to familiarize ourselves with the user flow and how information was presented. Digging deeper with further research on the sites, we included a quick comparative analysis against Intrepid’s competitors to see what each travel site offered. 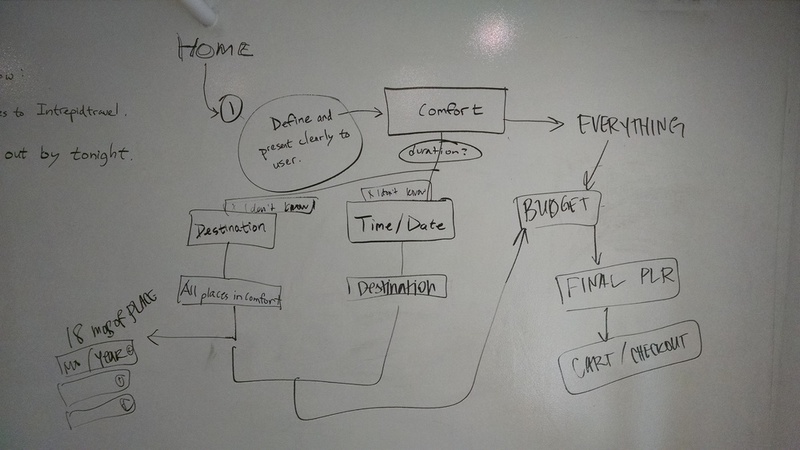 Mapping out the user flows and journeys, we started with the current flow on how a traveler would book their trip. We brainstormed on how to create a better flow. The easiest fix to alleviate one of the pain points would be to move information around. Because of who our user was (Barry), we felt that he would want to read as much as he could about “comfort” trips before deciding to book. A clear path would direct him to our informational page before moving forward to the next steps. Below was the version we arrived at. We also planned on creating two new features as Barry would like more customizable options on the trip and prefers not to travel in groups with strangers. Customization options for the trip — the traveler may choose to add additional activities for particular days of the trip (i.e. dinners, exclusions, etc). Trip type — the trip style is defaulted as group where travelers will be mixed with other travelers. We added two additional options allowing “comfort” travelers to choose solo (traveling alone with guide) or private group (good for families or travelers with their significant other with guide). These new options would obviously be priced at a premium compared to the group default. We also wanted to include a feature at the very end (post-confirmation screen) assisting travelers with their airline ticket booking needs. 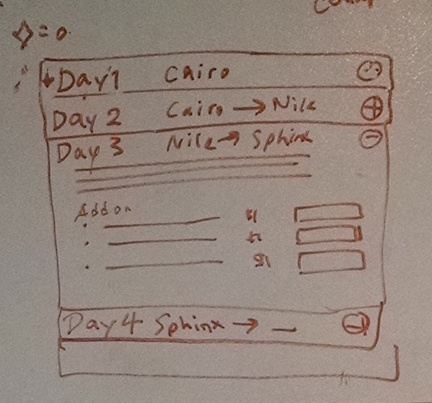 I worked out the initial sketches for the redesigned site along with my teammates. We wanted to highlight the most important features our user would care about while at the same time keep the feel and branding of Intrepid. We also took into account we were designing for an iPad screen. For the homepage, we felt a larger hero image would help the overall experience. Since it's a travel site, we wanted to emphasize that sense of wanderlust with beautiful scenery or culturally rich images. There would also be explanations of the various travel styles - placed at the top rather than towards the bottom. Initial sketches for the Trip Details page. The biggest challenge was laying out a plethora of information without confusing the user. With some brief user testing of the different iterations, we decided to go with a page scrolling straight down touching on the different sections as it seemed to be the least confusing. We opted for an accordion style menu for the itinerary section as it would save space and hide any information the user did not wish to see. A symbol would designate if there was a customizable add-on for that particular date. The user would then be able to choose to expand to view. We worked with simple wireframes to get a better visual sense and to give testers something to click through. We learned a lot from the clickable user testing in terms of button placements and the layout of information. Deciding on how the final version of the redesigned site should look, I started working on the hi-fi version using Axure, which allowed me build and link all the clickable assets within the program. Please feel free to access the final prototype here: Intrepid Site Redesign (iPad). *at the Checkout Page, double-click the First Name box to auto-fill and proceed to the Confirmation page. We stayed consistent with the hero images all the way to the Trip Details page. Scrolling down past the brief and the map, the user can begin their booking process and price out their trip, selecting from the type, dates, and finally, adding any additional exclusions to their itinerary. We also shortened the checkout process as well. After reviewing the itinerary with an itemized list of the trip and any add-ons, the user is directed to the Checkout Page, where they can easily enter traveler information and billing details. More user testing to further improve functionality. Create a native app for iOS and Android. Expand group editing capabilities so members of private groups have the ability to plan collaboratively. Build out the "Wanderlust" feature to match user's preferences through AI. Build out "My Account" function to save trips and keep track of orders. Improve reviews and further incorporate social media aspects of the site.